Russia’s Darya Davydova delivered a first gold medal for the host nation at the International Judo Federation (IJF) Grand Slam in Ekaterinburg today. The Düsseldorf Grand Slam silver medallist thrilled the home crowd in the Palace of Sports as she earned her first Grand Slam title with a devastating finish in her under-63 kilograms gold medal match against Britain’s European Championships bronze medallist Lucy Renshall. The 23-year-old Briton, also seeking a first Grand Slam title, was undone with 50 seconds left on the clock with a ura-nage for ippon. The first bronze medal was won by Catherine Beauchemin-Pinard of Canada, who held down world number 15 Agata Ozdoba-Blach of Poland for 20 seconds and an ippon to claim her country’s third medal from their women’s team in Russia. The second bronze medal was won by Hohhot Grand Prix bronze medallist Gankhaich Bold of Mongolia, who doubled her country’s medal tally in Russia by beating Israel’s Gili Sharir by a waza-ari score. 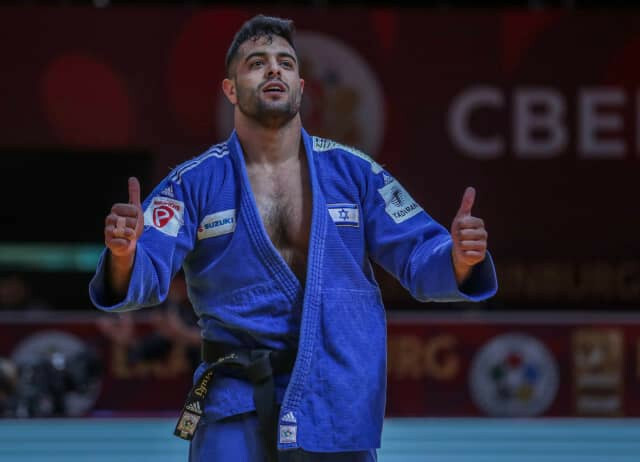 Israel’s disappointment at that result was lifted later in the evening as Sagi Muki, in the men’s under-81kg class, added a second gold medal to the one won on the opening day by his team-mate Gili Cohen in the women’s under-52kg final. Muki, the Paris Grand Slam silver medallist, beat Japan’s former world champion Takanori Nagasein to claim his third Grand Slam gold medal, waiting until the closing seconds before launching with seven seconds left with a shoulder throw for a waza-ari. Etienne Briand of Canada earned the first under-81kg bronze after Matthias Casse of Belgium was penalised with a shido for a false attack, it being his third and final indiscretion. The second bronze medal was claimed by Junior World Championships bronze medallist Luka Maisuradze of Georgia, who dispatched the mercurial Frank De Wit of The Netherlands with a front uchi-mata and ippon to earn his first Grand Prix podium finish. Sweden’s Osaka Grand Slam bronze medallist Tommy Macias upset the form-book in defeating the favourite for men’s under-73kg gold, Italy’s Olympic champion Fabio Basile. Macias, a former Grand Slam winner in Abu Dhabi, showed off his ne-waza prowess by manoeuvring from a possible hold-down to an armbar which forced Basile., who had excelled in the preliminaries as he sought a first IJF gold medal, tapped out using his left foot. There was another home medal on the night as Siberian native Evgenii Prokopchuk took men’s under-73kg bronze medal by defeating Georgia’s Georgii Elbakiev with a ko-soto-gake for ippon. The second bronze medal went to Behruzi Khojazoda of Tajikistan, who defeated Eduardo Barbosa of Brazil by a waza-ari score to win his country’s first Grand Slam medal. 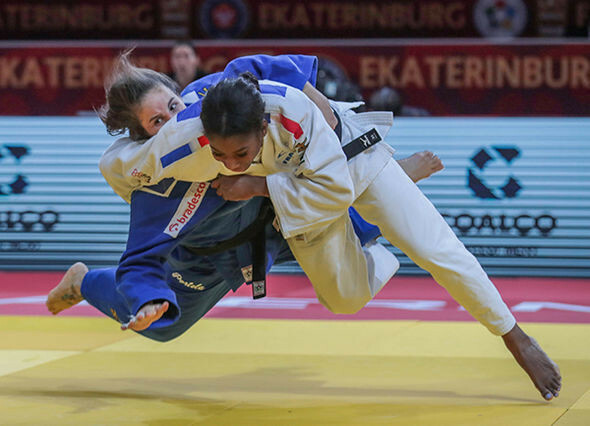 Top-ranked Marie Eve Gahie of France doubled her gold medal tally on the Grand Slam stage as she defeated former world number one Maria Portela of Brazil in the under-70kg final. Gahie, who previously won Grand Slam gold medal in Abu Dhabi in 2016, pounced on the ground to trap the powerful Brazilian, who was unable to muster any form of escape as the seconds elapsed for France’s second gold in Russia. Shiho Tanaka of Japan earned bronze by defeating Germany’s Olympic bronze medallist Laura Vargas Koch for ippon with 38 seconds left in the contest. The second bronze medal was captured by world number nine Assmaa Niang of Morocco, who flipped Michaela Polleres of Italy with a sumi-gaeshi for ippon after only 39 seconds. Niang thus earned her country’s first Grand Slam medal at her 17th attempt. The Grand Slam is due to onclude tomorrow.